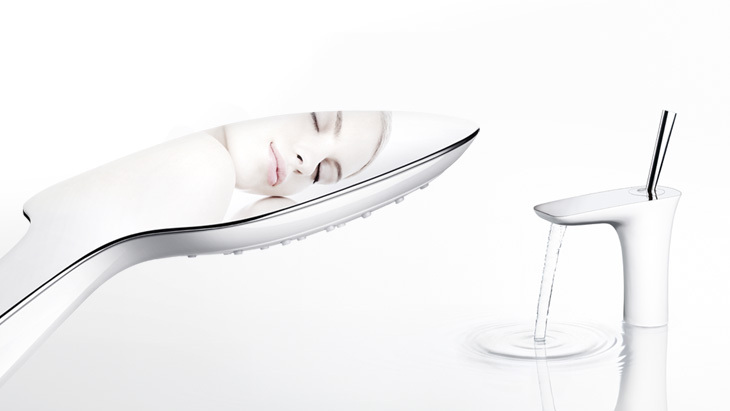 hansgrohe's avantgarde PuraVida mixer range is future-oriented in both form and function. Its look and feel make even the most demanding of customers want to touch, to linger a while and to savour. What are the benefits of PuraVida? The sculptural look is award-winning, and plenty of innovative extras make the range attractive to those who appreciate the beautiful and the sensual. The white/chrome finish brings a new design dimension to the bathroom. The dual material principle (DualFinish) allows surfaces to seamlessly blend together, brightening up the room with chrome and white. Stepless, silky-smooth, intuitive operation using the pin handle. A union of convenience and charm, constituting sheer pleasure. In addition to their beautiful form, PuraVida mixers are also environmentally friendly – thanks to the water and energy-saving technology EcoSmart. a 3-hole mixer and for wall mounting. The sensual design looks quite splendid in the shower and bath tub area too: floor-standing or wall-mounted, exposed or concealed variants of single lever mixers, rim-mounted bath mixers or 3 or 4-hole mixers: PuraVida has beautiful, matching product versions to suit any installation scenario. Concealed installation thermostats, shut-off and diverter valves and the RainBrain electronic control centre: these PuraVida control elements control the required water volume and temperature professionally and reliably. Accessories matching hansgrohe's Avantgarde bathroom style: lotion dispensers, toothbrush tumblers and soap dishes, towel holders, hooks and grab bars, roll holders and toilet brush holders.